These temperatures are an average taken throughout the day and night. Therefore, daytime temperatures may be considerably higher. Porto Weather and When to Go? Portugal’s second city sits along the Atlantic coastline in the north of the country, making it slightly less hot than more southerly destinations. Its historic centre is a UNESCO World Heritage Site and is one of the oldest, best preserved historic cities in Europe. So when is the best time of year to visit? Its location right next to the Atlantic actually makes Porto one of the wetter cities in Europe, but it also receives plenty of sunshine throughout the year, on a par with Mediterranean cities such as Rome and Barcelona. The rainfall is not evenly spread throughout the year. The summer months, particularly July and August tend to be a lot drier than the rest of the year, but these are also the months when the city tends to be swarming with tourists. Spring and early autumn can be good times to visit if you’re hoping to avoid the crowds and receive a fair share of good weather. June is probably the single month when the weather is likely to be good and the city is not going to be too busy. And there is another excellent reason for visiting in June; Sao Joao (St John's) Festival, probably the biggest street party in Portugal, is held here every year on the 23-24th June. It can be pretty wet in Porto in springtime, with rain falling on almost every other day in the months from March until the end of April. Late spring is generally sunny, with May usually seeing pleasant, mild weather, and average daytime temperatures in the high teens and even the low twenties. The summer months bring plenty of warm, sunny weather and tend to be a lot drier than the rest of the year. Unlike further south in Portugal, the hot, sunny weather can be interspersed with the occasional wet, cooler day, although the sunshine usually returns after a day or two. Average daytime highs hover around 24ᵒC (75ᵒF) in June and 26ᵒC (79ᵒF) in July and August, although many days will see temperatures reaching the30s (90’s Fahrenheit), and during occasional heat waves, temperatures can approach 40ᵒC (104ᵒF) in the city centre. But the humidity remains low, and cooling sea breezes usually keep the coastal areas quite mild and comfortable, especially at night. September is a transitory month, with a little more rainfall and slightly cooler temperatures than mid-summer, but it can be a very pleasant time to visit the city as there are usually plenty of warm and sunny days, whilst the summer crowds have dispersed. Through October and November, temperatures stay pleasant, with daytime temperatures typically in the low twenties and high teens, although moving into later autumn the area tends to experience a lot more rainfall. 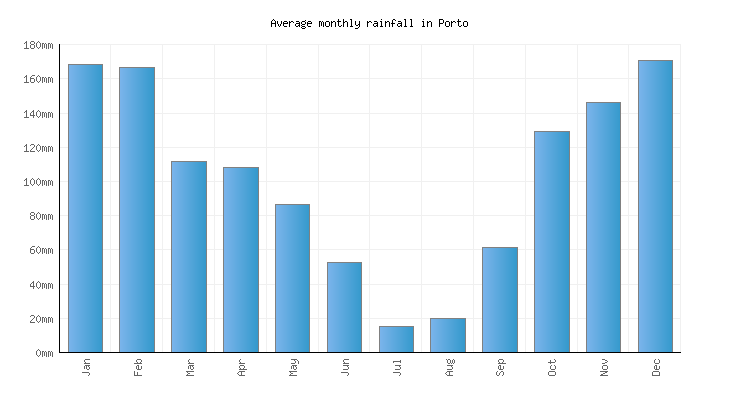 December is the wettest month of the year, receiving an impressive 180 millimetres of rainfall. Comparatively, the western parts of the British Isles tend to receive about 130 millimetres. 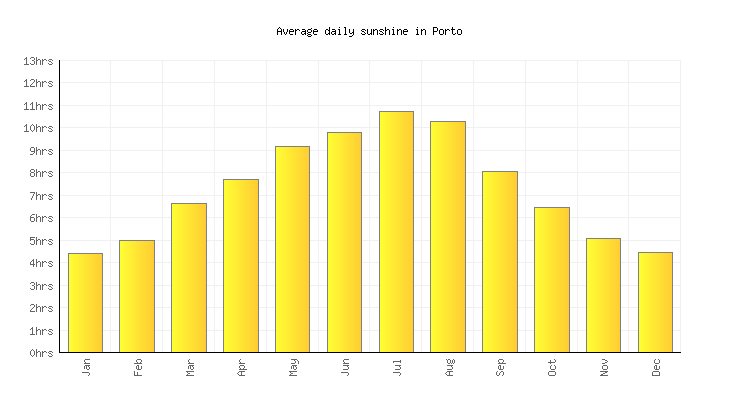 Yet Porto still manages to boast that the sun is shining for an impressive 124 hours in the month of December, nearly half of the hours possible. Daytime winter temperatures tend to be in the mid to low teens, whilst at night they can drop to about 5ᵒC (41ᵒF). Temperatures below freezing are very rare thanks to the proximity of the sea and the warming gulf stream.